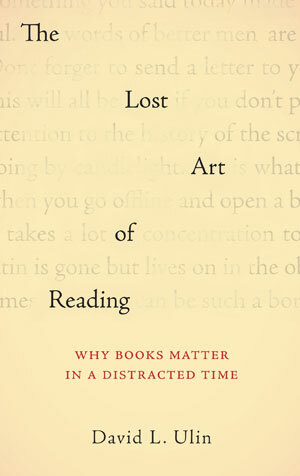 In his extended essay The Lost Art of Reading: Why Books Matter in a Distracted Time (Sasquatch Books, 2010), LA Times book critic David Ulin cites a 2009 study showing that in 2008, Americans consumed information for about 12 hours per day, and about 100,000 words per day. This, he explains, is the equivalent of a three-hundred-page novel, which at first seems encouraging. Except that much of this is a fragmented consumption of the “back-and-forth between texting, e-mail, print, Twitter, blogs and other websites,” amounting to what he calls a “collective data dump” (80). “This is where reading, real reading, comes in – because it demands space…Perhaps most important, there is the way reading requires us to pay attention, which cannot help but return us to the realm of inner life” (80). And from a psychiatrist working with ADD: “We have a generation of people who…are so busy processing information from all directions they are losing the tendency to think and feel. And much of what they are exposed to is superficial. People are sacrificing depth and feeling and becoming cut off and disconnected from other people” (81). These insights should caution us against our often superficial habits of mindless information consumption (I myself am guilty of this), and more importantly, they should move us into being more intentional about doing the kind of extended, concentrated deep reading that is fast becoming a thing of the past for many.